The Government of the Hong Kong Special Administrative Region (HKSAR) approved in principle the adoption of the Three-Runway System (3RS) as the future development option for Hong Kong International Airport (HKIA) for planning purposes on 20 March 2012, and also approved the recommendation of AAHK to proceed with the statutory environmental impact assessment (EIA). An EIA study brief (ESB-250/2012) for the 3RS project (henceforth referred to as the ‘project’) was issued by the Environmental Protection Department (EPD) on 10 August 2012. The EIA report has been prepared according to the EIA study brief requirements, which identified 12 key environmental assessment aspects to be addressed as part of the EIA study. On 7 November 2014, the EIA for the project (EIA Register No. : AEIAR-185/2014) was approved and an Environmental Permit (EP) (Permit No. : EP-489/2014) was issued for the project. The project locations with indication of potential land formation area including area reserved for aviation support development are shown in Appendix A. § Related airside and landside works, and associated ancillary and supporting facilities. Mott MacDonald Hong Kong Limited is commissioned to prepare the Marine Travel Routes and Management Plan for Construction and Associated Vessels in accordance with the Environmental Permit to minimise the chance of vessel collision and the disturbance to the Chinese White Dolphins (CWD) during construction of the project. (v) speed limit of 10 knots for construction vessels within Works Area and hotspots of the CWD (Section 7). This section presents a brief description of the types of activities that are considered as construction associated and identify the types of construction activities associated with the 3RS project. Details of working vessels that would typically be utilised for each type of construction activity were also described, in order to identify areas where potential impacts to water quality and CWDs could be minimised during the construction phase, and as such fulfill the requirements of the EP as stated in Section 1.2. There are various types of non-construction related activities proposed to be undertaken during the construction phase. These included survey boats, monitoring vessels and sampling vessels related to environmental monitoring and auditing (EM&A) and site investigation vessels related to quality control measures, and voluntary patrol vessels at the marine park and Dolphin Protection Areas. The above mentioned vessels will not form part of the construction and associated vessels under this Updated Plan. The 3RS project is going to be located on a new land formation immediately north of HKIA in North Lantau, covering a permanent footprint of approximately 650 ha. For the purpose of this Updated Plan, only those construction activities which are marine-based or would utilize construction and associated vessels are described in this section. Relevant activities include land formation, diversion of submarine aviation fuel pipelines, diversion of submarine 11kV cables, construction of runway approach lights, construction of marker beacons and general activities and these are described in the following sections. Although the diversion of aviation fuel pipelines does not involve major marine-based construction activities, it is anticipated that a positioning barge will be deployed to check the alignment of horizontal directional drill pipe (HDDP) and a floating platform will be set up in the Sha Chau and Lung Kwu Chau Marine Park (SCLKCMP). Transportation vessels will also be used to transport site staff to the Works Area located within the marine park. The main components of land formation comprise modification of the existing seawall, ground improvement of the underlying marine sediments, new seawall construction, filling, and surcharge. Ground improvement in lieu of dredging will be adopted to minimise any impacts to water quality and marine ecology. Marine site investigation (S.I.) works will be conducted regularly as quality control measures during ground improvement and reclamation works. To connect the new land formation area with the existing airport island, the seawall along the northern perimeter of the airport island needs to be modified to interface with the new land formation. Based on the construction details available at the time of preparation of this Updated Plan, The first construction activity is the laying of geotextile and sand blanket laying. The methods for sand blanket laying would include closed grab dredgers and hydraulic pumping with spreader pontoon. 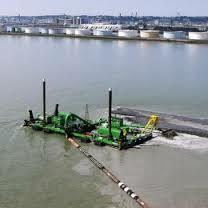 Where such closed grab dredgers are adopted, the proposed silt curtain would be a full enclosure cage-type surrounding the grab of the dredger (such full enclosures are typically associated with higher silt removal efficiency). 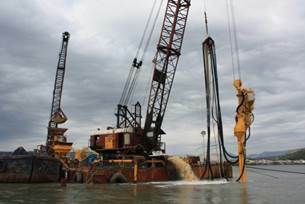 Where hydraulic pumping with spreader pontoon is adopted, a double-layer floating silt curtain surrounding the sand blanket laying activity would be implemented. Various ground improvement methods, including Deep Cement Mixing (DCM), Prefabricated Vertical Drains (PVD) and Stone Columns have been proposed for the 3RS project. The ground improvement methods to be adopted vary depending on location (within or outside the CMP boundaries) and the ‘land type’ to be supported. The majority of the seawalls for the airport expansion will comprise sloping seawalls, except for some localised areas where vertical seawalls are required. These seawalls will cover the entire boundary of the new land formation. Due to spatial constraints within each Works Area, sectional construction of the seawall shall not commence until after the completion of the respective seawall ground improvement works in that section. Different fill materials including rock fill, public fill, sand fill, rock armour and graded filter layer will be used to form the land and seawalls. Seawalls will comprise of rock fill as the seawall core, and rock armour and graded filter layer to form the protective layers. Sand fill or a mix of sand fill and public fill will be adopted as the marine filling material, while a combination of sand fill and public fill will be adopted for land filling activities. Temporary surcharging (primarily marine sand or public fill) will be applied to facilitate consolidation process in the soft clay layer. The surcharge material will be delivered via hopper barge, pelican barge and trailer suction hopper dredger (TSHD) and off loaded into dump trucks. Diversion of the existing submarine aviation fuel pipelines will use a horizontal directional drilling (HDD) method forming pipeline tuned by drilling through bedrock from a launching site located at the west of the airport island to the daylighting point adjacent to the Aviation Fuel Receiving Facility at Sha Chau, outside the land formation footprint (see Appendix A - Figure). Diversion of the submarine cables will use a direct bury (water jetting) method. A field joint will be installed to connect the diverted cable to the existing cables running to the Sha Chau Island, where existing cables will be exposed for a length of approximately 120 m using open trench method. On completion of the field joint, the cables will be re-laid and the open trench will be reinstated. The approach lights will extend off the eastern and western edges of the new land form into the adjacent marine waters. The section of the approach lights in marine waters will be installed on small marine structures supported with piles, on top of which the light barrettes will be placed. A maintenance deck in the form of a metal bridge extended from each end of the runway will be installed to allow access to these structures. The eastern section of the approach lights for the third runway is anticipated to extend into an area of CMPs. Therefore, it is currently proposed that the area beneath each light stand will be improved with DCM prior to piling. To demarcate the HKIAAA boundary, it is proposed to install around nine beacons along the boundary of the HKIAAA. Depending on the requirements by Marine Department, these beacons may need to be provided as fixed structures. Based on initial scheme design, the beacons are anticipated to be single piled structures topped with steel light posts. General activities include material storage and delivery of other site materials and construction equipment, maneuvering and anchoring of working barges or vessels, transportation of site staff, exportation of surplus fill and/ or waste for disposal and Marine S.I. works. The various types of vessels proposed to be used during the construction phases are described in Table 2‑1 below, making reference to the approved EIA for 3RS and the Scheme Design Final Report. Detail refinement is subject to the detailed design and Contractors to be on board in different phases. Photos of the recommended construction and associated vessels are presented in Appendix B. * This may be a crane barge or other non-self-propelled vessels that will remain stationary on site for the duration of the HDD works. Note: The working vessels involved in the aforesaid construction methods and activities will be subject to change and the availability of construction plant. This category includes crane barges, derrick barge, floating platforms, spreader pontoons, hopper barges, DCM barges, water jetting barge and flat-top barges etc. These types of vessel will be stationary within the Works Area most of the time and the positioning / re-positioning of these vessel types by tug boats and anchor boats will be carried out at slow speed. This category includes TSHD, pelican barges, tug boats, anchor boats, transportation boats, and transportation sampans. When moving to and from the Works Area, these vessels may be able to travel at slow to intermediate speed (up to around 20 knots). However, in the vicinity of the project area they mainly operate at slow moving speed (around 5 knots up to maximum 10 knots). These vessels generally have high maneuverability. For the sampan the travelling speed should be less than 10 knots. This category includes TSHD, pelican barges, derrick barges, hopper barges and flat-top barges, etc. These are large, slow moving vessels while the last three types of barges are non-self-propelled vessels that rely on tug boats for manoeuvring. As assessed in the approved EIA report, construction vessels will be largely slow-moving, however the activities they will be undertaking may cause physical disturbance and can cause noise disturbance to CWDs. Noise from the slow moving vessels themselves is not expected to have a serious impact on CWD behaviour and was considered of low impact significance in the EIA. Also, the risk of construction vessel collisions with CWDs was also considered to represent a low impact significance in the EIA. Even so, skipper training and vessel controls have been recommended as precautionary measures in the EIA report to further minimise any potential impacts. A speed limit of 10 knots should be strictly observed for construction vessels within the areas with high CWD density. The following sections outline the control measures and restrictions proposed for Contractors intending to operate construction and associated vessels in undertaking their 3RS works activities. Section 3 details the technical guidelines for preventing water quality impacts from vessel operation, Section 4 details the practices and measures for keeping the number of construction-related vessels to a minimum, Section 5 includes further detail on predefined and regular routes for construction vessels with Section 6 providing detail on skipper training and guidelines for vessel operations in the presence of dolphins. Thereafter, Section 7 provides further detail on construction vessel speed limits in CWD hotspot areas and Section 8 provides new information on how the measures are to be implemented and monitored. Potential water quality impacts associated with the operation of construction-related vessels include sediment plumes, wastewater discharge and accidental spillage of chemicals and fuel / oil into the marine environment. To control and minimise the identified water quality impacts, the Contractors must ensure compliance with relevant environmental legislation and regulations as well as implementation of appropriate mitigation and precautionary measures. The relevant requirements are summarised in the sections below. All discharges into any drainage or sewerage systems, or inland or coastal waters, or into the ground, within a Water Control Zone are controlled under the Water Pollution Control Ordinance (WPCO), except the discharge of domestic sewage into foul sewers or the discharge of unpolluted water into storm drains or into the waters of Hong Kong. Construction site discharges are controlled under the WPCO. As such, all construction-related discharges for the Project must comply with the WPCO, and the terms and conditions of a valid WPCO licence. No construction vessel or construction-related vessel is permitted to discharge any wastewater into the marine environment without a valid WPCO licence. Each Contractor shall be responsible for the application of any licences required for the construction vessels and construction activities under that contract. This memorandum specifies the water quality standards for different types of discharges and discharge locations. All wastewater generated by the Project shall be treated to meet the standards specified in the TM-DSS. All Hong Kong ships wherever they are and all ships within Hong Kong waters are required to follow the MARPOL 73/78 regulations for prevention and minimisation of pollution to the environment due to ship operations. The Convention specifies requirements for addressing pollution to the environment in respect of (i) oil; (ii) noxious liquid substances; (iii) harmful substances in packaged form; (iv) sewage; (v) garbage and (vi) air pollution from ships. In all cases where the equivalent local regulation is not available, the MARPOL 73/78 regulations shall be applied. To prevent and minimise the risk of water quality impacts, the following measures shall be implemented when applicable/ necessary for all marine vessel-related activities during construction phase of the Project. § Decks and exposed fittings of barges and hoppers shall be cleaned of excess materials before moving the vessels. § Pipes and fittings connecting the barges with the spreaders shall be properly fitted and checked for leakages before operation, and any identified leaking pipes shall be repaired immediately. § Adequate freeboard shall be maintained on barges to minimise the likelihood of decks being washed by wave action. § All vessels shall not be permitted to release any foam, oil, grease, litter or other objectionable matter into the waters within and surrounding the Works Area. § Regular inspection for objectionable matter (e.g. foam, oil, grease, scum and floating refuse) in the waters within and surrounding the Works Area shall be conducted. Such objectionable matter, if present, shall be regularly collected and removed to an appropriate off-site disposal facility. § All vessels should follow the International Convention for the Control and Management of Ship's Ballast Water and Sediments to minimise the release of exotic species or pollutants through ballast water. § Avoid filling barges and hoppers to a level which may cause overflow of materials or water pollution during loading and/ or transportation. § All vessels stationed or manoeuvring outside the boundary of the silt curtains surrounding the construction Works Area shall maintain adequate clearance between the vessel and the seabed at all states of the tide to prevent undue turbidity generated by turbulence from vessel movement or propeller wash. Vessel captains will be reminded during the Skipper Training Workshops to regularly check the Sound Navigation and Ranging System (SONAR) or marine map of Hong Kong showing the water depth, in order to remain alert to shallow water areas when navigating to the Works Area with sufficient clearance between the vessel draft and the seabed. § Anchors should only be deployed when vessels required for station at designated location for long period or for other valid safety reasons to avoid frequent anchoring and de-anchoring activities. Anchoring and de-anchoring activities should be avoided when the vessels are still moving to minimise disturbance to seabed. § Any wash water from cleaning of decks and equipment shall be treated to meet WPCO / TM-DSS requirements before discharge. The Contractors shall obtain the licence(s) required for discharge of treated wastewater. § No direct discharge of contaminated water is permitted. § Bottom opening of barges shall be fitted with tight fitting seals to prevent leakage of material. § All fuel tanks / fuel storage containers (excluding fuels stored as part of vessel bunkers) shall be secured (within an enclosed area if possible) and contained within a sealed and bunded area. The bunded area should have capacity to contain at least 110% of the storage capacity of the largest tank / container held within the bunded area. § All fuel tanks / fuel storage containers should be inspected daily to ensure the containers are in good condition and there are no openings which oil / chemical can possibly leak out. Any damage / openings to the storage area and drip trays should be repaired or replaced immediately. § Where chemicals are temporarily taken outside the sheltered chemical storage area, the chemicals including the drip trays / bund should be covered by waterproof tarpaulins and kept free of rainwater. § Construction activities shall be programmed and coordinated to minimise the number of vessels required. A 3-month rolling programme for construction vessel activity for each construction Works Area shall be prepared by each Contractor and updated monthly to demonstrate the required number of vessels are necessary with AAHK/PM endorsement. § Vessel movements shall be kept to a minimum. The practices to keep construction-related vessels to a minimum are presented in Section 4. § All vessels shall not exceed 10 knots within the boundary of the construction Works Area as shown in Figure 6‑2. § Vessels shall follow the pre-defined routes and prescribed marine traffic arrangements to minimise the risk of collision. Details of the predefined routes are presented in Section 5. § Construction and associated vessels shall not enter the Dolphin Protection Areas as shown in Figure 5-5 and described in Section 7.1 under normal circumstances. The above items will fall under the control of the marine traffic monitoring system arrangements detailed in Section 8 and these arrangements will be monitored by the staff of the associated on-shore control room. The vessels mentioned in Table 2‑1 are not expected to be present all at the same time due to phasing of construction activities. Good planning of construction vessel activities can contribute to effective management of the number of vessels on site to a minimal level. All works Contractors will be required to submit a monthly construction vessel activities programme to report the actual construction vessels deployed and marine movements together with the planned vessel movements on a 3-month rolling basis, so as to identify the anticipated construction vessels movements for the coming 3 months for optimum control and effective monitoring. The number and types of construction vessels proposed by the Contractors will be checked by AAHK/PM to ensure the proposed deployment is necessary and minimal. Such rolling vessel plans provide a means of actively managing vessel activities during the 3RS project. Staff in the on-shore control room will coordinate between multiple Contractors making reference to respective vessel plans to ensure the vessel activities follow the rolling vessel plan, the marine travel routes prior to entrance to the Works Area as well as the movements inside and outside the Works Area. The on-shore control room staff will also communicate with Contractors frequently to check if they have minimised the number of vessels in accordance with their rolling plans and mooring activities of vessel outside the Works Area especially at dolphin hotspots will also be monitored. The Contractor shall submit updated contact list to AAHK / on-shore control room staff regularly to ensure that all the construction vessels skippers could be efficiently contacted by on-shore control room staff. Any idling barges and barges being for overhaul maintenance work shall be demobilized off site as early as practical. To minimise the potential temporary disturbance due to the delivery barges and stationary construction vessels north of the airport platform during construction, marine construction traffic including construction plant, construction vessels and barges should be kept to a practical minimum. Idle vessels in the Works Area shall be avoided as far as practicable, and this can be achieved through good construction programme planning that seeks to maximise productivity and storage capacity from each plant/ vessel, minimise the number of plant/ vessels required along with minimising required occupancy within the Works Area. The overall objective is to keep the number of working or stationary vessels present on-site to the minimum at anytime. 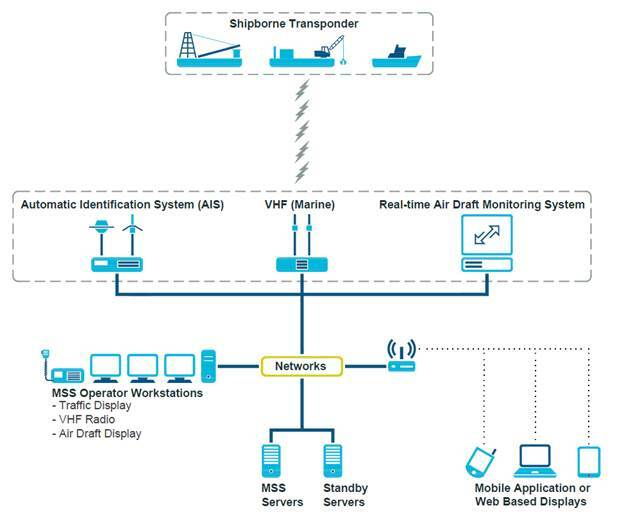 AAHK will establish a Marine Traffic Monitoring System and associated on-shore control room to monitor, manage and communicate with construction vessels. Arrangements for overall management of the system and detail on the on-shore control room are detailed in Section 8.1. For land formation activities during the 3RS project, every effort will be taken to minimise the export of surplus construction and demolition (C&D) waste to landfill, hence reducing the vessel movements for C&D waste exportation. For example, where possible the extent of excavation will be minimised, and the surcharge material used for one Works Area will be re-used as surcharge or fill for another Works Area, where the programme permits. Construction materials will also be planned and stocked carefully to avoid unnecessary generation of waste and this will be facilitated through the preparation and implementation of contract-specific Waste Management Plans. In order to keep the number of passenger vessels for staff to a minimum and to ensure efficiencies in transporting staff between Works Area and piers, marine works contractors will be required to provide regular passenger vessels on a scheduled basis, in particular during peak working hours. Staff shall travel to and from marine Works Area from designated landing points with high utilisation of each passenger vessel to be safeguarded (e.g. ad hoc transportation of a few staff by large vessels shall be avoided as far as practicable). Marine works contractors will be required to monitor the numbers of passengers and passenger vessels in operation as works progress and shall ensure that the operations of passenger vessels for staff are kept to a practicable minimum. An unloading point on 3RS land platform will be constructed therefore the Contractor can make use of land transport for the delivery of plant/material and labour force across the newly reclaimed land so as to minimize reliance on marine transportation. The predefined and regular routes for construction vessels travelling to and from the construction area were determined by the Marine Traffic Impact Assessments (MTIA) conducted for contract P281-Third Runway Reclamation Design Consultancy Services (BMT, 2014) and this MTIA was also referred in the approved 3RS EIA report. The following sub-sections describe the key factors which have already been considered for the travel routes of construction vessels. Vessels and barges have been routed into water-spaces where they would have the least impact on existing marine traffic during the construction period. Figure 5‑1 presents a mapping of average daily marine traffic density, with “density” defined as the total length of vessel tracks passing through each square kilometre per day. These areas of concern included the water-spaces and channels within the Western Harbour, around Tsing Yi and through Ma Wan and Urmston Road. Although Urmston Road does not encounter particularly high incident rates given its traffic density, operationally it is a critical channel for the navigation of oceangoing vessels. Note: The unit Kilometers / Square Kilometer describes the total length of vessel routes within each square kilometer. Construction and associated vessels’ operating license conditions have been taken into account as these may prohibit entry into certain areas. There are restricted areas in the vicinity of HKIA (i.e. 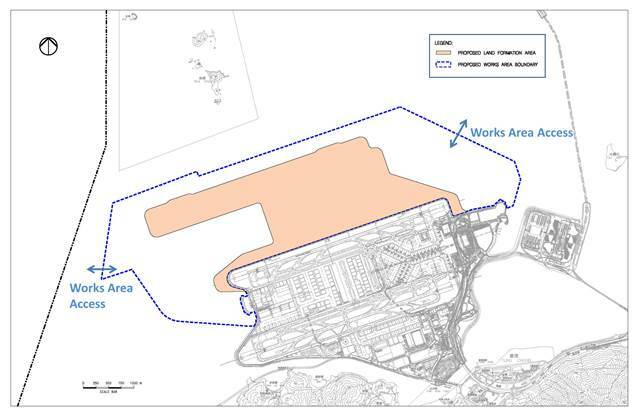 Hong Kong International Airport Approach Area (HKIAAA), the existing Sha Chau and Lung Kwu Chau Marine Park, and planned The Brothers Marine Park) where vessels are not allowed to enter without authorization and except for those circumstances as detailed in Section 5.2.1 (Figure 5‑2). The airport height restriction (AHR) limit is another consideration and if a vessel exceeds the AHR requirement, the Marine Department, Civil Aviation Department and Airport Authority Hong Kong must collectively agree on practical route realignment that does not compromise the safety requirements of aviation and airport operations. In addition, it is vital for all vessel deployments to comply with other navigational restrictions, for example various bridge area restrictions (i.e. Tsing Ma, Kap Shui Mun, Tung Chung, Tsing Yi, etc.) and speed restrictions, for example within the Harbour, etc. as shown in Figure 5‑2. Adequate water depth is a key issue for the determination of travel routes. Larger draught marine vessels would be limited from approaching the Works Area from the northwest due to relatively shallow water depth (see Figure 5‑3). For the construction and associated vessels that require to take the west gate for entry into the works area, the vessel captains should remain alert the relatively shallow water depth at the western waters when travelling from the east and northeastern waters to the south of the Sha Chau and Lung Kwu Chau Marine Park. Vessel captains will be informed of shallow water depth areas along the Marine Travel Routes during the Skipper Training Workshops. Vessel captains will be reminded to regularly check the Sound Navigation and Ranging System (SONAR) or marine map of Hong Kong showing the water depth, in order to remain alert to shallow water areas when navigating to the Works Area with sufficient clearance between the vessel draft and the seabed. In addition, it is noted that regular hydrographic surveys will be undertaken within the marine Works Area during the project (see Figure 5‑4) and information on seabed levels will be provided to the On-shore vessel Control Room (see Section 8.1.1) to ensure appropriate information is relayed to vessel operators on changing water depths during the marine works phase. The construction vessels are of a type commonly found navigating Hong Kong waters. Construction vessels are free to navigate through large areas of Hong Kong waters via existing channels taking routes common to most of Hong Kong’s marine traffic. The areas where new or uncommon movements will be introduced are the waters in vicinity of HKIA, which covers Urmston Road, channel to the north and to the west of future land formation. In-depth examination of critical issues within these areas has been undertaken during the design of marine travel routes for construction vessels. The local constraints imposed by the Works Area of adjacent projects and other marine facilities, such as anchorage and bunkering areas (Figure 5-5), have also been considered in designing the marine travel routes for construction vessels. Based on the discussion with the Advisory Council on the Environment during the EIA stage, AAHK has also proposed to implement additional Dolphin Protection Areas that linked to existing Sha Chau and Lung Kwu Chau Marine Park (Figure 5-5). The Dolphin Protection Areas will be implemented during the construction phase with restriction to construction and associated vessels entry under normal circumstances prior to the designation of the proposed Marine Park for 3RS project. In view of the marine vessels and oil barges that may anchor in anchoring and bunkering areas respectively, the design of the construction vessel travel routes has avoided crossing through these areas due to safety concerns and potential operational impacts. The marine travel route for construction vessels was proposed based on best available information. Nevertheless, the use of marine travel routes by construction vessels inside and outside the Works Area would be monitored by the proposed on-shore control room (it will be operated for 24 hours if night time works are required) with the use of tracking system to be installed on all construction and associated vessels (details to be discussed in Section 8 of this Plan). In addition, the Contractor would prepare rolling vessel plans for the effective management of the numbers and the movements of the construction vessels. The risk of any marine accidents within the construction Works Area would be minimised with these measures. Most of the non-self-propelled vessels expected to be deployed during the construction works are barges associated with ground improvement works (Section 2.4.1) and seawall construction. Most of these vessels and associated tug boats will enter the Works Area during mobilization periods before commencement of the relevant phases of the construction works. They will then stay and work within the construction Works Area. The associated tug-boats will be required to use the predefined and regular routes to maneuver all non-self-propelled vessels when they travel outside the Works Area. Self-propelled vessels (Section 2.4.2) and vessels delivering materials to and from the project site (Section 2.4.3) shall be required to use predefined and regular routes to reduce disturbance to cetaceans due to vessel movements. Specific marine routes covering waters outside the Works Area, designed based on the key factors mentioned in Section 5.1.1 to Section 5.1.4, together with the trip frequencies (including anticipated peak and average forecast traffic movements per day), are shown in Figure 5‑6 to Figure 5‑8. The indicative marine traffic routes of construction vessels will be implemented on the commencement of reclamation from which time the number of construction vessels will be kept to a practical minimum. Restrictions on marine traffic routes are not applicable to vessels working on HDD pipeline and CLP cable laying, and ground investigation. HDD works involve drilling activity well below the seabed in the bedrock level and only positioning barge will be temporarily mobiled (few hours a day) to assist the detection of HDD pipeline alignment. In addition, floating platform is expected to be set up just off the Sha Chau Island to support the HDD daylighting and pipelines connection works on land. For the cable laying works, the route of the water jetting barge will follow the replacement cable alignment (See Appendix A) and works will be done at a slow speed along the alignment. As a high volume of construction vessel traffic is not anticipated for these works, no additional restrictions are defined for this marine work effort. The guiding principle for the development of barge transit routes was to route barges into water-spaces where they would have the least impact on existing marine traffic during the construction period. Areas of particularly busy marine traffic include the navigable waters and channels within the Western Harbour, around Tsing Yi and up through Ma Wan and the Urmston Road area. Urmston Road is a busy operational channel used by broad ranging vessel types including Ocean going vessels. To avoid interfacing with the existing marine traffic in the aforesaid areas of concern, the bulk of barging volume associated with this project will be directed to arrive at the works site principally from the west of the Works Area. This includes those barges entering Hong Kong Waters from the north, which have been routed west and south of the SCLKCMP. Construction marine traffic is to be minimised through the Urmston Road as far as practicable. As illustrated in Figure 5‑6, the only transits which have been routed through Hong Kong’s busiest waters are the 18 daily transits by public fill barges (i.e. hopper barges) to and from Tseung Kwan O and the 14 daily transits by TSHDs transporting marine fill to and from the South China Sea during the peak period. For the public fill barges, diverting them south of Lantau to access the Works Area from the west would increase the transit time by over 50%, therefore this traffic volume is accepted to travel through the Western Harbour and Ma Wan areas. The water depth constraints of TSHDs mean that they must enter Hong Kong via the East Lamma Channel. As the construction materials and fills may be shipped from the Pearl River Delta or South China Sea by barge, construction vessels are routed to enter the Works Area through designated site entrances on either side of the land formation footprint primarily to minimise crossing traffic within the narrowed channel north of the HKIA (Figure 5‑6). 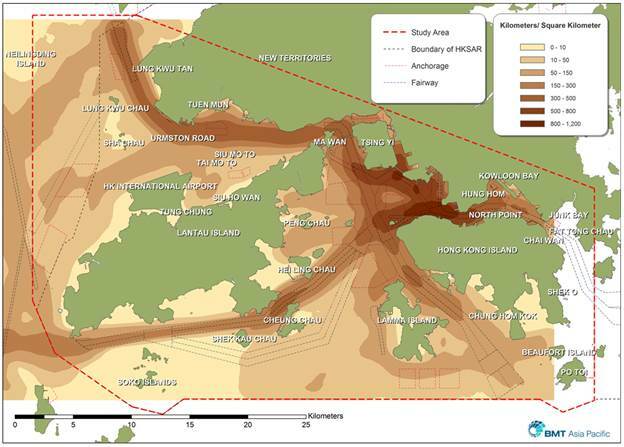 Proposed construction vessel routes have mostly avoided the existing and future marine facilities shown in Figure 5-5. They have also avoided the planned Marine Parks (i.e. the planned BMP, SWLMP, SIMP and the proposed marine park for IWMF Project) as well as the Dolphin Protection Areas at the construction stage. However, the existing sea channel between the BCF project and the Dolphin Protection Areas (Planned Brothers Marine Park) is being blocked by the silt curtain deployed for the BCF project. Under this circumstance, the construction and associated vessels are temporary allowed to pass the fringe of the Dolphin Protection Areas with 10 knots speed limit prior to the designation of the Brothers Marine Park to minimize the disturbance to this water. Once the Planned Brothers Marine Park is designated, the contractors shall strictly follow the Marine Travel Routes and Management Plan for Construction and Associated Vessels (MTRMP-CAV), the construction and associated vessels should not enter the Dolphin Protection Areas. The route along Urmston Road passes close to the SCLKCMP and this area is a key CWD habitat (Hung, 2015) and a 10-knot speed restriction will be applied in regions with high CWD abundance, as determined by referring to a Dolphin Habitat Index that has been established for waters in this area (see Section 7.3 for details). The marine travel route should not be changed once approved. Reasonable justifications shall be provided if any changes of the proposed routes are required. The Pilotage Advisory Committee Paper No. 4/2016 recommended that an inshore traffic zone of about 300m to 400m in width shall be maintained between the boundary of the proposed marine parks (Southwest Lantau Marine Park and Soko Islands Marine Park) and the nearby Lantau Channel Traffic Separation Scheme (LCTSS) / Traffic Separation Scheme at South of Lantau (SLTSS) to allow an unrestricted and safe channel for navigation and to minimize potential impacts to marine users. 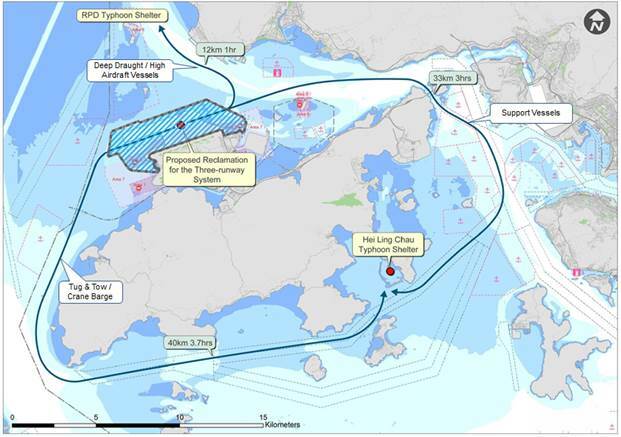 Taking into consideration marine safety, an inshore traffic zone of about 400m in width is proposed between the Hong Kong water boundary and the western part of the Dolphin Protection Areas to allow the 3RS construction vessels coming / leaving from the southwest to the Works Area. The construction vessels passing through this inshore traffic zone shall be kept not more than 10 knots. It is noted that existing submarine aviation fuel pipelines will be diverted as part of this Project by using a HDD method to drill through bedrock from a launching site located at the west of the airport island to a daylighting point on Sheung Sha Chau Island. Some construction and associated vessels will therefore have to enter the SCLKCMP. As good practice, it is recommended that the construction vessels travelling to and from the work site within the SCLKCMP shall minimise their travelling route within the Marine Park as well as adhering to the 10 knot speed limit applicable inside the Marine Park. Apart from transportation boats and those vessels involved in materials delivery, many of the working vessels (e.g. crane barges, derrick barges, tug boats, DCM & PVD barges, spreader pontoons, etc.) will mostly stay within the Works Area. Guidelines for safe vessel operations in the presence of CWDs (Section 6.2), including keeping to 10 knots speed limit within the construction Works Area, will be implemented to minimise any disturbance from such vessels to CWDs. Vessel captains shall strictly follow all navigation safety requirements and international practices with the help of navigation instruments. Marker buoys and navigation buoys will be used as marine based indicators to help the vessel captains in locating the proper traffic routes under actual situations and during any unexpected incidents. Marine travel routes may be attuned locally for safety reasons, taking into account other marine vessels that may be encountered by construction and associated vessels. The navigation routes may also be affected by natural factors including wind, currents, waves, poor visibility and periodic closure of certain routes (e.g. due to other unusual events). A key commitment is that there shall be no transportation of oversize materials or easily spillable materials such as marine fill during inclement weather. Construction and associated vessels will not enter the Dolphin Protection Areas as shown in Figure 5-5 under normal circumstances. The Dolphin Protection Areas have been implemented during the construction phase, within which there will be effective management controls on construction vessels of the 3RS project. Vessel captains will be informed of the above principles for the general routes for construction vessels within the Works Area during the Skipper Training Workshops. Contingency plans will be developed for periods of disruption, such as typhoons, strong monsoon signals, thunderstorms, black rain alerts, and accident incidents upon commencement of land formation works. Specific plans will need to be developed by relevant parties, but those operating construction and associated vessels may be expected to adhere to the general principles outlined below. The typhoon arrangements will require all work barges/craft to leave the Works Area as soon as possible when Typhoon Signal no. 3 is hoisted. It is anticipated that the main designated typhoon shelters for works vessels will be the Tuen Mun Typhoon Shelter and the Hei Ling Chau Typhoon Shelter. 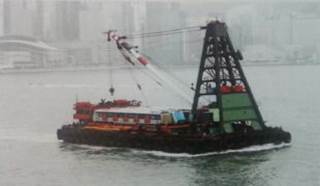 Tug & tow / crane barge will not use the same route adopted by supporting vessels to the Hei Ling Chau Typhoon Shelters to avoid overcrowded of vessels once the Typhoon Signal 3 is raised. Although the proposed routes for tug & tow / crane barge would pass through area to CWD hotspots and proposed marine parks in south-west Lantau waters, the disturbance on CWD hotspots, the Dolphin Protection Areas and proposed marine parks is anticipated to be insignificant as tug & tow / crane barge are slow moving and they will only use the route during infrequent typhoon event. However, due to the large numbers of works vessels involved in the construction of the reclamation, it is possible that typhoon shelters within Hong Kong waters will not be able to cater for this level of demand. Works vessels will also have to shelter within deep water space within Mainland China providing the nearest sheltered site. Procedures should be developed by all marine works Contractors to allow for a phased departure of works craft from the site in the event of a typhoon, so that navigation channels do not become overcrowded and to avoid obstructing the passage of other vessels on or before the Typhoon Signal no. 3 is hoisted. Figure 5‑8 presents potential routes to be taken by works vessels during typhoons. § Deep draught / high airdraft vessels should be first to leave the site when the Typhoon Signal no. 3 is anticipated to be hoisted by the Hong Kong Observatory within 4 hours. § Tug & Tow vessels should then leave the site after these deep draft vessels have left. 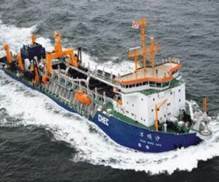 § Smaller, more maneuverable support vessels will then leave the site when the Typhoon Signal no. 3 is hoisted. In case of marine accidents (e.g. collision, grounding, search and rescue including aeronautical incident) that may occur during the construction stage, actions will be required to manage vessels during these events and re-routing and control and regulation of marine traffic may be required. It is anticipated that this response will be similar in manner to the response to such incidences elsewhere within Hong Kong waters. The precautionary / mitigation measures of potential oil spill can be referred to in the Spill Response Plan (SRP) which provides the guidelines for setup of contract-specific SRPs by Contractors. The ET shall provide training to vessel skippers to ensure vessel operations pose minimal risks to CWDs. The training shall include briefings on predefined routes, general education on local cetaceans, guidelines for avoiding adverse water quality impact, the required environmental practices / measures while operating construction and associated vessels under the Project, and guidelines for operating vessels safely in the presence of CWDs (Section 6.2). The ET shall schedule the training with individual marine Contractors and shall ensure all marine vessel skippers working on the Project are adequately briefed and trained prior to marine construction or prior to skippers commencing work operating vessels in Project Works Area. The overall principles for construction vessels travel within / outside the Works Area are shown in Figure 6‑1. The training materials will be prepared by ET and endorsed by the CWD specialist, and all material used should be updated time to time during the construction of the project. The ET will conduct the training and refresher courses as and when required (e.g. in the event that the regular travel route is updated along as work progresses), to ensure that the vessels shall operate in a dolphin-friendly manner. All relevant training records and training materials shall be kept by the ET and made available to IEC, AAHK and EPD upon request. § Construction and associated vessels shall not anchor or stopover within the existing and all planned Marine Parks in the western waters (including the existing SCLKCMP, the planned The Brothers Marine Park (BMP), Southwest Lantau Marine Park (SWLMP), Soko Islands Marine Park (SIMP), and the proposed marine park for the Integrated Waste Management Facilities (IWMF) Project), except for the case of the SCLKCMP in association with works on the diversion of aviation fuel pipeline with AFCD’s authorization and the temporary works such as setting up the generator at the Sha Chau, Sheung Sha Chau and Lung Kwu Chau for the cable diversion work. § Construction and associated vessels shall not enter the Dolphin Protection Areas (see Figure 5-5) under normal circumstances. Apart from transportation boats and those vessels involved in materials delivery, many of the working vessels (e.g. crane barges, derrick barges, tug boats, DCM & PVD barges, spreader pontoons, etc.) will mostly stay within the Works Area. However, all vessels shall adhere to the speed limit of 10 knots or below within Works Area as shown in Figure 6‑2. The construction and associated vessels shall adhere to the 10-knot speed limit within the Works Area, to minimise any disturbance from such vessels to CWDs. According to the approved EIA report, construction vessel impacts were evaluated as of low impact significance to CWDs. However, mitigation measures including speed limits of 10 knots in CWD hotspots (this section) and skipper trainings (refer to Section 6.1) are recommended as precautionary measures. Speed limit of 10 knots for construction vessels appears to be effective in protecting CWDs from vessel collisions and acoustic disturbance. In addition, the Dolphin Protection Areas (see Figure 7-5) have been proposed during the construction phase in response to ACE comments during the EIA approval process, within which there will be effective management controls on construction vessels of the 3RS project. The proposed routes of construction vessels have been designed to avoid construction vessels travelling across existing and all planned Marine Parks in the western waters (including the existing SCLKCMP, the planned BMP, SWLMP, SIMP, and the proposed marine park for IWMF Project), in order to avoid disturbance to the marine parks. As discussed in Section 5.2, the proposed marine travel routes for construction vessels have mostly avoided all planned Marine Parks in the western waters (i.e. the planned BMP, SWLMP, SIMP and the proposed marine park for IWMF Project) as well as the Dolphin Protection Areas. The proposed marine travel routes have also avoided the Dolphin Protection Areas (see Figure 7-5) proposed by AAHK in response to ACE comments during the EIA approval process. However, given that the route along Urmston Road to the northeast of SCLKCMP is a CWD key habitat, a 10-knot speed restriction will be imposed on the construction and associated vessels traversing areas with high CWD abundance (i.e. ‘highly critical’ dolphin habitats in Figure 7-5). In order to determine the area to which speed limits of construction and associated vessels should be applied for reducing impacts on CWDs, data from the AFCD long-term surveys (see Hung 2014 for a description of these data) have been evaluated to make the best possible determination of the relative value of each 1 x 1 km grid for use in this exercise. The latest available data including the recent marine mammal monitoring report (Hung, 2015) has been taken into account for developing the dolphin habitat index. All of these four factors are based on dolphin numbers per unit effort, but including data on the four factors helps to ensure the analysis has broad temporal and biological relevance, and minimizes impacts of potential data anomalies from using just a single factor. A matrix of the relevant data was compiled. For each 1 x 1 km grid, there are four values presented, corresponding to the four factors listed above, and for each one evaluated as “Low”, “Medium” or “High” (note that these are subjective descriptive terms, though objective quantitative values for building the matrix were used). For densities (both current and historical), the corresponding values for “Low” were 0.0-20.0, 20.1-40.0 for “Medium”, and 40.1 or above for “High”. For habitat ratings, the corresponding values for “Low” were 0-10, 11-20 for “Medium”, and 21 or above for “High”. For 50% core areas, the corresponding values for “Low” were 0-10, 11-30 for “Medium”, and 31 or above for “High”. Relevant raw data are presented in detail in Hung (2014) and Hung (2015). The dolphin habitat index is then developed for each grid as shown in Figure 7‑5. The resulting matrix (see Figure 7‑5) identifies highly critical areas of CWD habitat to the northeast of SCLKCMP which are delineated by boundary points A – J with GPS coordinates. Speed limits within these areas will be limited to 10 knots or less and this will be communicated to construction vessel captains during the skipper trainings. However, there may be exceptional cases that the 10-knots speed limit could be relaxed for contingency arrangements (e.g. during typhoon, adverse weather conditions) and for safety or emergency purposes. The CWD “Hotspot” areas will be reviewed annually based on the AFCD Marine Mammal Monitoring Report. 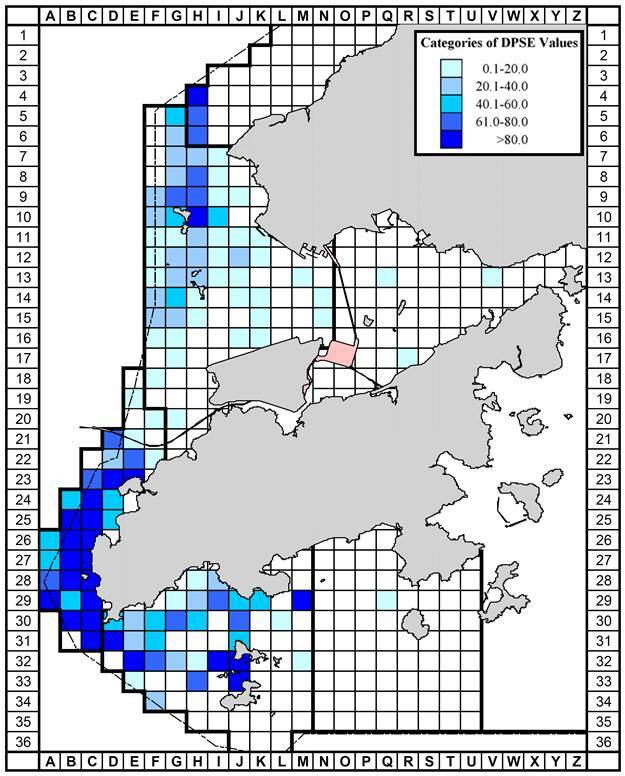 Figure 7‑1 Current density of Chinese White Dolphins with corrected survey effort per km2 in waters around Lantau Island between January – December 2014 (number within grids represent “DPSE” = no. of dolphins per 100 units of survey effort; from Hung, 2015). In the dolphin habitat index developed for this plan, DPSE of 0.0 – 20.0 is rated as “Low”, 20.1 – 40.0 as “Medium” and 40.1 or above as “High”. 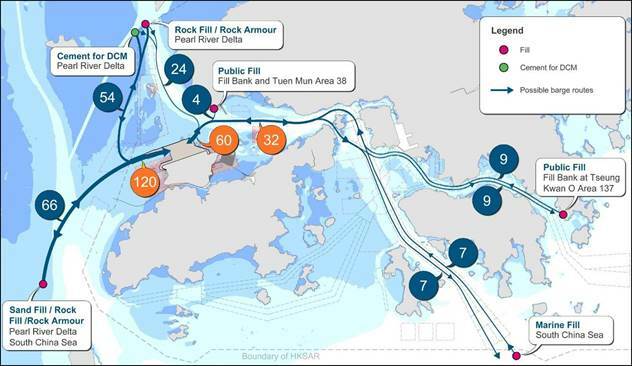 Construction vessel routes for land formation works have been developed to keep the majority of transits out of Urmston Road and other key channels within Hong Kong Waters. It is recommended that construction vessels access the works site via the west and east site entrances to avoid using the busy channel north of the Works Area. § Neither anchor nor stopover within the existing and planned marine parks area without authorization. § A clearly defined set of warnings for non-compliance with prescribed navigation controls. Vessels which deliver materials including for example sandfill, rockfill and prefabricated units are expected to pass through the Urmston Road Channel and some CWD hotspots. If temporary material delivery vessels that have not been registered with AIS will require a guard boat with AIS installed to lead the way within the Works Area until the vessels station within the Works Area, otherwise, the vessels will not be allowed to enter the Works Area. 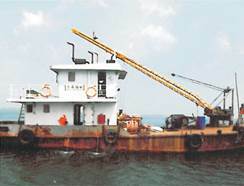 In order to keep the construction-related vessels to a practical minimum, the site staff transportation vessel could be act as the guard boat during the transitional period. The contractor should ensure that the material delivery schedule is arranged where the site staff transportation vessel is able to lead the temporary material delivery vessel to the designated construction Works Area. A tight control on the marine travel routes will be implemented to minimise traveling routes within CWD hotspots. Site investigation (S.I.) vessels which mainly deployed for preparing the construction works and stationary at specific S.I. monitoring locations at most of the time, are not classified as construction and associated vessels. However, S.I. vessels will also travel to/from the Works Area via designated transit routes and access / depart works site via designated site entrances with speed limit same as other construction vessels. For this kind of S.I. vessel which may not equipped with an AIS tracking system, the contractor should provide alternative tracking records (e.g. global positioning system (GPS) log) to the on-shore control room for auditing. The tracking records should include the time, date, coordinates, travelling route and travelling speed. For the newly awarded contractor onboard, ET will work with the Contractor to review and get familiarised with the requirements of this Updated Plan in the first month including predefined and regular routes for construction vessels covering waters both within and outside the Works Area, speed control within the Works Area, CWDs hotspot areas and Dolphin Protection Areas, as well as providing skipper training to the captain. Tracking systems (e.g. AIS) will be used in all construction and associated vessels to record use of the marine travel routes for track logging. For the field joint excavation, Front End Mobile Units (FEMUs) have to be installed in the barges for disposing sediment in Civil Engineering and Development Department (CEDD) dump pits locally or designated pits in Mainland China. Administrative control will be taken to check the tracking system data regularly by staff of the on-shore control room. All daily records of marine travel routes used (including details, times, dates and purpose of journeys) will be maintained by the supervising staff. The records shall be submitted for inspection by Contractor’s representatives upon request. The captains of construction vessels and their companies or material suppliers will receive formal warning notice if records show the approved marine travel route was not followed. During the construction phase the Environmental Team will be required to audit the implementation of the “Regular Marine Travel Routes Plan” and construction vessel adherence to requirements detailed in this Updated Plan. Travel route logs, including coordinate points logging of individual tracks and graphical plots of all vessel tracks overlaid on the base map of Hong Kong, shall be provided to the Environmental Team Leader, Independent Environmental Checker and AAHK at regular intervals after commencement of the marine construction works. During water quality monitoring, observations of the surrounding activities will be recorded. Should exceedance of water quality be recorded, inspection will be carried out including checking of the observation log, the AIS data showing the construction traffic route and volume of construction traffic at the time of exceedance. The available records on number of construction vessels within the work site should also be reviewed. Actions will be taken if exceedance of water quality is recorded according to the Event and Action Plan recommended for the water quality monitoring as presented in the EM&A Manual. In particular, the ET should discuss required mitigation measures with the Contractor, IEC, and AAHK/PM. In the event that frequent water quality Action or Limit Level exceedances happen without apparent reasons, efforts should be made to analyze if such exceedances are attributable to the number of construction vessels in the works site for consideration of possible remediation actions, such as limiting the number / movement / anchoring or de-anchoring of construction and associated vessels on site. § The International Regulations for Preventing Collisions at Sea 1972. Implementation would be enforced by AAHK and implemented by the Contractors and will apply to all vessels engaging in construction works under 3RS contract agreements. However, AAHK has ultimate responsibility for overseeing marine traffic control measures as described in 8.1. Construction related marine vessel traffic management including the implementation of all of the precautionary and mitigation measures as approved by the Statutory Authority will be coordinated by the AAHK established Marine Traffic Monitoring System / on-shore control room using suitable AAHK or specialist consultant staff along with Contractor’s representatives if necessary. The Environmental Team will monitor and audit the implementation and effectiveness of the precautionary and mitigation measures as stipulated in this Updated Plan. This Updated Plan presents a summary of major construction works and details the types of vessels and marine plant expected to be involved. Technical guidelines to avoid adverse water quality impacts during vessel operations, as well as practices to keep construction-related vessels and marine plant to a practical minimum have been provided. The different factors considered in determining construction vessel travel routes in the MTIA are summarized and both general and contingency arrangements are provided in the design of the marine travel routes. Specifications for skipper training as well as guidelines for safe vessel operations in the presence of CWD are covered in this Plan. A 10-knot speed restriction is designated in the Works Area and in ‘highly critical’ dolphin habitats that have been determined by Dolphin Habitat Index making reference to the AFCD monitoring reports of marine mammals in Hong Kong waters. In addition, methods of implementing and monitoring the effectiveness of the proposed mitigation and precautionary measures through the use of an AAHK established and managed Marine Traffic Monitoring System / on-shore control room are detailed. This facility will be managed by AAHK and overseen by the Environmental Team to ensure compliance to this Updated Plan by all 3RS vessel operators. The predefined and regular routes for construction vessels are subject to further review during detailed design and construction stages and this Updated Plan shall be updated as necessary. BMT. (2014). Marine Traffic Impact Assessment for Hong Kong International Airport Contract P281 – Third Runway Reclamation Design Consultancy Services – Scheme Design Report. Hung, S. K. 2008. Habitat use of Indo-Pacific humpback dolphins (Sousa chinensis) in Hong Kong. Ph.D. dissertation. University of Hong Kong, Hong Kong, 266 p.
Hung, S.K.Y. (2015) Monitoring of marine mammals in Hong Kong waters (2014-15): Final report (1 April 2014 to 31 March 2015). Submitted to the Agriculture, Fisheries and Conservation Department for the Hong Kong SAR Government. Available from http://www.afcd.gov.hk. *Note: Depth is measured vertically from the bottom of the keel to the side of the deck. Draft represents the distance measured from the bottom of the keel to the waterline. Information not available is denoted as N.A. Specifying the survey boats, monitoring vessels and sampling vessels related to environmental monitoring and auditing (EM&A), site investigation vessels related to quality control measures and voluntary patrol vessels at the marine park and 3RS Dolphin Protection Areas will not form part of the construction and associated vessels under this MTRMP-CAV. As these vessels require to enter those ecological sensitive habitats as part of the EM&A and quality control requirements. Based on the construction details available at the time of preparation of this Updated Plan, the methods for sand blanket laying have been updated. Based on the construction details available at the time of preparation of this Updated Plan, the types of working vessel have been updated. The restricted areas in the vicinity of HKIA such as existing Sha Chau and Lung Kwu Chau Marine Park, and planned The Brothers Marine Park has been added in this Updated Plan. Construction and associated vessels are not allowed to entered without authorization. For the construction and associated vessels that require to take the west gate for entry into the works area, the vessel captains should remain alert the relatively shallow water depth at the western waters when travelling from the east and northeastern waters to the south of the Sha Chau and Lung Kwu Chau Marine Park. According to the Pilotage Advisory Committee Paper No. 4/2016, the boundaries of the proposed marine parks (Southwest Lantau Marine Park and Soko Islands Marine Park) have been updated. 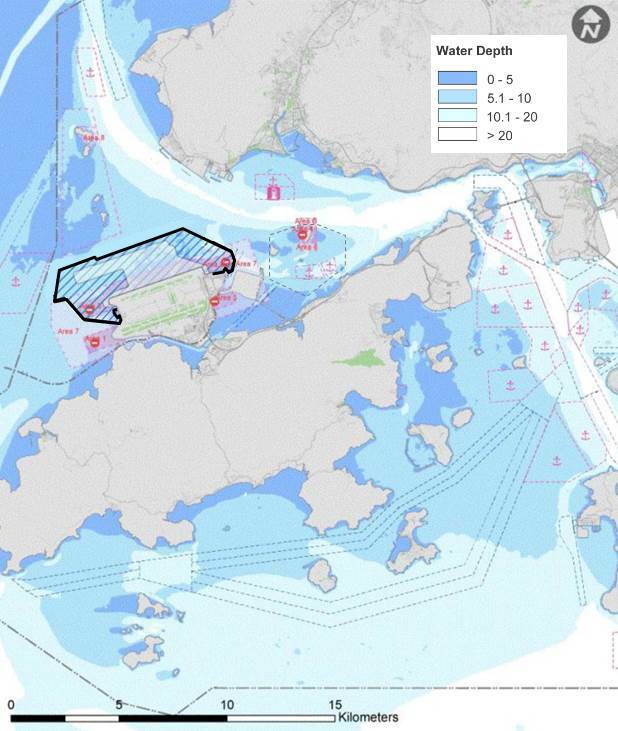 An inshore traffic zone of about 400m in width is proposed between the Hong Kong water boundary and the western part of the Dolphin Protection Areas to allow the 3RS construction vessels coming / leaving the southwest Hong Kong waters to the Works Area. The construction vessels passing through this inshore traffic zone shall be kept not more than 10 knots in speed. Further to the Fire Services Department’s comment, emergency access points should be provided at the northern side to the Works Area. During the transitional period, vessels that have not been registered with AIS will require a guard boat with AIS installed to lead the way within the Works Area until the vessels station within the Works Area. For the newly awarded contractor onboard, ET will work with the Contractor to review and get familiarised with the requirements of this Updated Plan in the first month. The sea channel at the eastern part between the Hong Kong Zhuhai Macao Bridge Boundary Crossing Facilities (BCF) project and the Dolphin Protection Areas (Planned Brothers Marine Park) is blocked by the silt curtains deployed by the BCF project. Under this circumstance, it is proposed that the construction and associated vessels could pass the 3RS Dolphin Protection Areas with 10 knots speed limit prior to the designation of the Brothers Marine Park. Upon the Brothers Marine Park be designated, the contractors should strictly follow the MTRMP-CAV, i.e. the construction and associated vessels should not enter the Dolphin Protection Areas. The planned Marine Parks have been updated in the relevant sections. The Construction and associated vessels should avoid traversing through and shall not anchor or stopover within existing and all planned Marine Parks in the western waters (including the existing SCLKCMP, the planned The Brothers Marine Park (BMP), Southwest Lantau Marine Park (SWLMP), Soko Islands Marine Park (SIMP), and the proposed marine park for the Integrated Waste Management Facilities (IWMF) Project), except for the case of the SCLKCMP in association with works on the diversion of aviation fuel pipeline with AFCD’s authorization and the temporary works such as setting up the generator at the Sha Chau, Sheung Sha Chau and Lung Kwu Chau for the cable diversion work. Note that DCM refers to a ground improvement method / soil mixing technique in which cement slurry is mixed with soft soil to produce a cemented soil compound with higher strength and stiffness than the original soil. Different variants of this method have been widely adopted in other countries and exist under different terms such as Cement Deep Mixing (CDM), Cutter Soil Mixing (CSM), Cement Deep Soil Mixing (CDSM), Deep Soil Mixing (DSM) or Deep Jet Mixing (DJM) (all based on the same operating principals).